This book has gotten a lot of flack for two reasons: (1) A number of people were upset by the large amount of errata posted after the book came out. (2) A number of people were upset by the perceived power-creep that this book carried with it, especially in the archetype section. Both of these are reasonable complaints that I largely agree with. That said, this book also contains a cornucopia of player options that are great fun. A number of the classes it introduced are now mainstream: it’s hard to imagine playing the game without options like the Brawler, the Investigator, the Slayer, the Bloodrager, the Hunter, or the Warpriest. Or to play without archetypes like the Bolt Ace (Gunslinger), Mutation Warrior or Martial Master (Fighter). Moreover, the book introduced a number of feats that improve on the available build options available to most players (Extra Hex! Slashing Grace!). Likewise, although the spells in this book seem to have flown under the radar, there are a lot of nice and interesting spells are introduced in this book (Glue Seal, Communal Align Weapon, Wall of Blindness/Deafness, Wall of Nausea, Anti-Incorporeal Shell, Adjustable Disguise, Adjustable Polymorph, Investigative Mind, etc). Easily 5 stars worth of good material here. Given the unusually large amount of errata, I feel compelled to deduct a star. 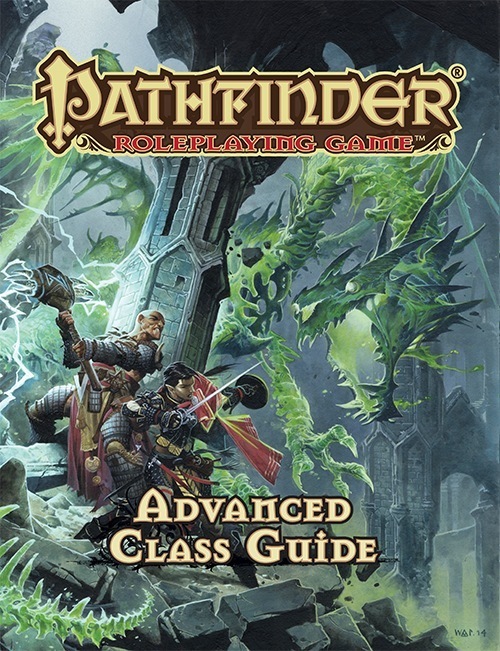 But all that said, it’s hard to imagine playing Pathfinder without this book -- after the Core Rulebook and Advanced Players Guide, it’s probably the best book for players to pick up. This book still sticks out as one of Paizo's biggest missteps. It was extremely rushed and it shows. At least half of the new classes don't even need to exist as anything other than archetypes. Even among the ones that actually work, most feel very uninspired. There are a few good things in it, but not really enough to justify buying it. It's not worth your money and it's best not to encourage sloppy work. Hopefully Paizo learns from this and prioritizes quality over quantity and speed from now on. The ACG had problems. Many problems. And it continues to have problems. From concept ("Let's make ten classes as complicated and broken as the magus, or more so! "), to out-of-whack game design, to simply poor editing, the ACG is a mess. The book's philosophy seems to be "create a new utterly unbalanced mechanic, and proliferate it as far as possible." The (quickly issued) errata pulled some of it a bit more into line, but it just doesn't come close to correcting it. Even something as simple as alchemical items are way out there. Holy Weapon Balm costs 5gp more than holy water, and does 1400% more damage. And that doesn't even include increasing damage to incorporeal creatures. Even two years after it was released, I continue to be impressed with the complete disregard for balance and sense in this book. If power creep had happened this much every year, we'd be looking at 9999 damage caps by now. The ACG stands out for its insanity. Perhaps pulping it for the cover error would have been the better move. I am extremely disappointed in this product, and glad I only purchased the PDF version. As other reviewers have pointed out, the new classes are poorly balanced when compared to the preexisting ones, and would be a better fit for a book like Unchained, much like Unearthed Arcana's gestalt characters. 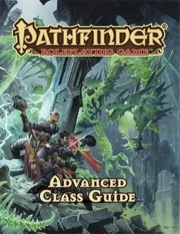 There's far too many feats and toys dedicated to these new classes, which drastically lessens this book's universal appeal, and even though some contrivances are provided to make some of said feats accessible to other classes, it ends up painting the book's title as a misnomer - it isn't an "advanced class guide" any more than it is a guide mostly about ten new classes, that are "advanced" only in the sense that they're more powerful than the others. It's my fault for not properly researching the book before buying it, so buyer beware if you're expecting to find a literal advanced class guide, as opposed to a lengthy introduction to ten new ones. Okay, there's a lot here that's just terribly rushed and it shows, like the editing here is painful at points. The classes themselves range wildly in value, and there's a lot of examples of Paizo's classic retro nerfing of things to help make options here look better. This was an obvious rush to gencon book, and it shows. While not everything in it is bad, and there's some salvageable content, you could easily continue to play the game without this book and miss out on absolutely nohthing. I, for one, am looking forward to taking a warpriest out for a spin. My top hope is for some more Oracle curses...it does say more options for ALL classes, not just the new ones. 1.) That the arcanist will be able to do the immediate action out-of-turn counter-spelling as in the prior playtest by making a check and spending pool points. This has the potential of really shutting down enemy spell-casters. 2). The Shaman continues to improve as the hexes were kind of weak but the 2nd playtest definitely showed that the shaman has great promise. My hope there would be revisiting most of the existing, getting rid of that 1/day do 1d4*lvl/2 stuff and worse. I hope they've improved the damage outputs of the energy blast exploits. I loved the stuff in the playtest, can't wait to see the full thing. A Must Buy! I can't wait to see some Archetypes for Shaman. I am thinking that the big surprises will be in the archetypes and feats -- if they are done well, they should open up some major opportunities for unusual hybrid character types. I'm hoping some of the classes (ahem...shaman) got a major overhaul..
Really looking foreword to seeing the finale version of the Arcanist and Warpriest. It'll be before that, as it'll release at Gencon in mid August. Amazon's dates are reasonably 'pick out of a hat' at the moment. August? I'm going to have to get a job! -New oracle mysteries and curses(must finish mute curse). -New summoner evolutions and base forms. -Dex to damage feat that anyone can get. -A jester archetype for bards. -A feat that grants extra skill points. -Polymorph spells for fey, outsiders, oozes, etc. -Alternate rules for unarmored characters for all classes. -Alternate rules for increasing skill points(from 2+int to 4+int) for classes like fighter, cleric, sorcerer, etc. Antipaladin love would be appreciated. I think the reason we haven't seen more antipaladin love is that the class is not...player friendly, in the traditional sense. The only place you can really play one is an evil campaign. If you're playing an antipaladin in a mostly good or neutral party, you'll find yourself rather underpowered and irrelevant unless you have lots of good-aligned adversaries to smite. Never mind the fact that the party is not likely to trust a psychopathic murderer whose powers are bestowed upon him by an evil deity. Now don't get me wrong, I would also love to see more support for the class. Some of the AP's best villains (Such as Staunton Vhane or Malyas) are antipaladins. If nothing else, I'd like more antipaladin options to make interesting NPCs. You can already see class details in Hero Labs. Consider checking out Pathfinder Campaign Setting: Inner Sea Combat. My fingers are crossed for ninja, samurai, and antipaladin material. I was pleased with the ninja tricks in Champions of Balance and I'm hopeful for more! Those are from the Playtest. Yay! Looking forward to picking this up at GenCon. I have been playing a slayer from the playtest. I cannot wait to get my hands on the real thing. Loved a lot of the classes from the playtest,so i think i'll roll at least one char per class once i have the real thing.Totally going to buy it! My players told me recently I buy too many books for us to use in our games, given how little we get together these days. "Feh!" I shouted. "Feh on your 'too many books'!" Yeah, I'm buying this. I've waited too long for this book. It must be mine. After this one, I'm hoping for a book on demon lords, etc. in the same style as the monster entries in Bestiary 4 and the Wrath of the Righteous AP - particularly as I am not buying WotR because I'm not into running a mythic campaign. Any chance someone from Paizo could confirm or deny that Shaman might get a JuJu Shaman archetype. I know the Oracle has one. The shaman is a combo of Oracle and Witch and the character concept in my head sees my Mwangi Shaman being able to make fetishes, throw salt to halt undead or make circles of protecton via the salt, use entrails to tell very limited glimpses of events, etc. I saw the write up for JuJu Oracle mystery in the Serpents AP and just thought it was very cool and fit a shaman better. Even in that article they called the Oracles "shaman"
Just was hoping maybe someone could give me a yes or no without giving away any of the Archetype itself. Will probably be playing my Shaman up until Iron Gods comes out and I make a new character for that AP. Thank you! Then you will love the recently announced Champions of Corruption. Otherwise, your best hope is that any special feats they provide for paladins are generic enough to work for antipaladins. The same could be said about ninjas and samurai. I would certainly welcome more options for my Antipaladin. I would also like more options for Samurai and Ninjas. I would also like more character classes inspired by Asian settings and other cultures. Though I know that isn't going to happen in this book except through archetypes and feats. I am really looking forward to getting this book! There will be a PDF, right? Yes, but it won't be released until the end of August for non-subscribers. I want this book so good. I haven’t been this excited since the APG or even the Core book. Mostly interested in Arcanist, Swashbuckler and the Warpriest, but investigator could be awesome. I’m also looking forward to bloodrager, slayer and shaman. If the Shaman has a mix of druid and cleric spell list it could very well be one of my favorite new classes. Interested in how the brawler, hunter and skald turned out since the three was the classes I found least appealing in the play test. Regardless Arcanist, Swashbuckler, Warpriest, Investigator, Bloodrager and Shaman are enough for me to get this book both as a hard cover and a PDF. I hope the bloodrager got a sensible spell list. Not the one from the second version of playtest. Warpriest also desperately needs a trimmed down spell list like the magus. I am really interested in the Swashbuckler, Brawler, and Investigator. I really wish the Shaman was that cha based spontaneous caster with the druid spell list and totem spirit animal "bloodline/mystery" that I have been wanting for ages. I wish the hunter was a non-spellcasting martial class that focused on it's animal companion. Bloodrager- great a barbarian with more sorcerer bloodline powers then a sorcerer. Arcanist- Lets beat the sorcerer at being a spontaneous caster and make the wizard wish he was like me. Warpriest- Still would have liked a martial divine class that doesn't have to be lawful good. Skald- never really cared for this one. Huh. Is that a new cover? Doesn't look like a WAR piece. And I hope that the bloodlines will be better balanced against each others. In the playtest there were only few I could see myself playing. And some for special circumstances. Plenty of advice on how to construct a new character class, archetype, or prestige class, giving the GM powerful tools to make the rules they need for their game. Noooo! I want it now or at least next week. Can I bribe someone? Who and what do they want? Will we see these new "advanced classes" on the srd or d20pfsrd sites anytime soon? I would imagine that they will be there after the book is released at the earliest. Can any of the devs on this project give me a page count for this specific entry in this book? I have no interest in yet another player focused splat book and there was some chatter early on that a class building toolkit was not really being considered for this book. So is this a 10 page chapter on advice, existing class ability breakdowns, or? Would it be possible to get some better definition on this aspect? This is the only reason why I would consider getting this book - some kind of toolkit/guidelines, even it it isn't an class ability scoring system. I hope the first class iconics revealed are the Arcainist, Swashbuckler, and Investigator.